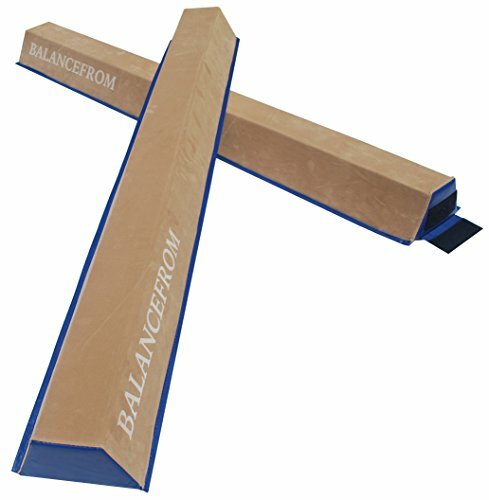 Overview: BalanceFrom balance beams are an excellent development aid that can greatly benefit young gymnasts, martial artists, cheerleaders, and even special needs students. BalanceFrom balance beam is constructed with high density firm foam material. Then they are covered by high grade synthetic suede. Very similar to the feel of competition beams. Easy to use, easy to carry around. Our sectional floor balance beam is excellent for gym or home use, for young gymnasts, cheerleaders and martial artist. Dimensions: Each beam: 5’ long x 4” high with 4” top that tapers down to 8” wide base. 2 beams in the package. Beams connect together and other beams easily with the velcro fastener.